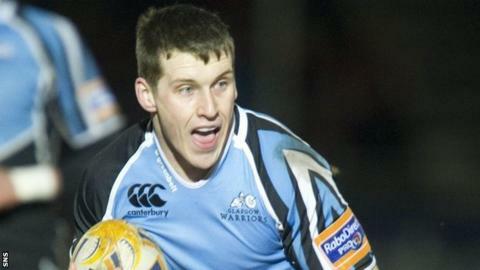 Scotland under-20 international Mark Bennett has signed a one-year deal with Glasgow Warriors. The centre moved from Warriors to French side Clermont Auvergne in 2011, but returned to Glasgow in November. He has since made three appearances for Gregor Townsend's side, scoring his first try against Dragons in February. "Mark has shown a great deal of maturity since arriving back and we're really pleased that he's signed up for next season," said Townsend. "Since breaking into the team he has not only shown his attacking threat, but also his defensive qualities. "He had to be patient before earning his first start and he did that by impressing at training and working hard on his game. "When he did get his chance he seized on it, and that's a valuable quality to have," added Townsend.